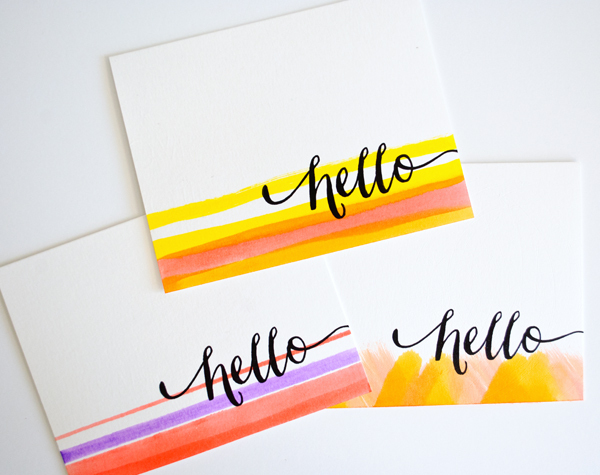 Three flat, one layer, watercolored cards using Waltzingmouse Hello Happy Thanks (this awesome set is on sale....). MOOD WHEN DONE = Delighted. Now it is time to clean up the mess I've created in my stamp zone and put away some new stuff. Awesome, cheerful cards Joan! And I like "Hello" as a sentiment - it can be used for so many occasions. Thanks for the great ideas! Clean and simple and lovely. The stripes of bright color are so pretty, I must try this soon. My ink daubers have about an inch of dust on them. Super to see how you are using your class homework:) Simple and Delicious colors! these are beautifully done. the class is so fun. I think these are just gorgeous! I'll be casing this idea! Love the simple stripes and sentiment! Beautiful set of cards. I love that you watercolored stripes just along the bottom of the card. They are so simple and so lovely!